It is bitter cold here, it was only 2 F or -17 C when I got up this morning around 8. I got to sleep in because we got the day off due to the cold. Yay. I took the image I am sharing today on a much warmer day in December. It was fairly cold relatively then but nothing like today. 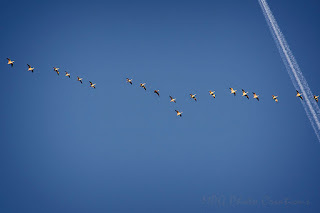 The Canada Geese were headed south over my house and crossing a vapor trail.